Google wants to democratize artificial intelligence and is looking to facilitate this shift with new and improved machine learning-based services hosted on its Google Cloud Platform. That’s according to Dr. Fei-Fei Li, the chief scientist of artificial intelligence and machine learning at Google Cloud, who announced new and improved machine learning services during this year’s Google Cloud Next keynote. 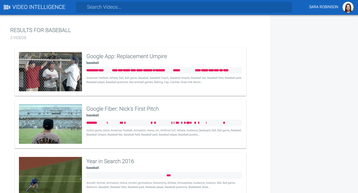 The new Video Intelligence API offers video-centric machine learning capability currently available in private beta, and as its name suggests, is accessible via a REST API popular with developers for its ease of implementation. The service, which was demonstrated at the event, will essentially parse through videos at machine speed to identify everyday items, objects, and even places with text labels. Users can then search for relevant entities across entire video catalogs, with matches automatically linked to their precise locations on a visual timeline. Google says the API uses the same building blocks as Google’s existing vision recognition models that power video search in YouTube. It joins a growing family of machine learning APIs that are designed to make it easy for any developer to integrate machine learning into their applications. The use cases for the Video Intelligence API include media archiving, where media organizations with years of incomplete metadata can use the API to identify when and where specific entities appear in videos, so the content can be repurposed or reused. “Speaking of democratization and reaching many people. If you can imagine combining the reach of this platform with the power of AI. Making it available to everyone. We can witness a greater improvement in quality of life than at any other time in history. This is why delivering machine learning and AI through Google Cloud excites me,” Li said at the keynote. “We are seeing people are using big data to do customer analysis, pattern matching analysis, and customer targeting that really does produce extra insights. And that extra insight is worth billions,” added Eric Schmidt, executive chairman of Google’s parent company Alphabet. “The company has both the money, the means and the commitment to pull off [this] new platform of computation globally, for everyone that needs it… to allow you the freedom of choice, and the freedom to innovate,” he said.